There’s an old adage that goes, “Never let the truth get in the way of a good story.” Why am I not surprised that this seems to be the motto of director Quentin Tarantino’s World War Two epic, Inglourious Basterds. A complete disregard for historical accuracy is one of the least methods Tarantino uses to shock and surprise with the audacious, left-field storytelling he’s become synonymous with. In the mode of the Dirty Dozen, a crack military team has been assembled to fight the Nazi scourge. Lieutenant Aldo Raine has gathered a squadron of the toughest Jewish- American soldiers in the service with only one mission: Kill Nazis. Of American Indian extraction himself, Raine hearkens back to the lessons of his warrior forefathers and impels his men to show their worth in scalps; one hundred scalps per every man in his platoon. The brutality of these “Basterds,” as they’re quickly known, becomes the stuff of Nazi nightmares, with entire regiments of SS fighters slaughtered, each missing the top of their heads. If a Nazi is fortunate enough to find mercy among the Basterds, he doesn’t leave without a highly-visible eternal memento of his crimes courtesy of Raine’s body-modification skills with very large hunting knife. 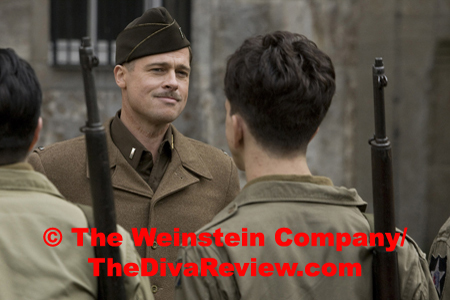 Unfortunately, the Basterds formation doesn’t come in time to stop the many atrocities of Hitler’s army. One SS officer, Colonel Hans Landa, demonstrates why he is known as The Jew Hunter in a small French village as he uses mind games and keen perception to spellbind and intimidate a well-intentioned farmer into giving up the Jewish family he’d hidden under his floorboards. In a rare show of clemency (- or foolhardiness) Landa allows one of the young daughters of the family he brutally massacres to escape. 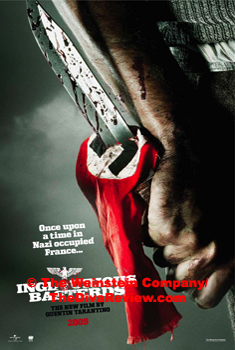 This will be a mistake that comes back to haunt both himself and the Third Reich as the now-grown Shosanna Dreyfus is inexorably placed in the position to avenge the death of her family and indeed every so-called undesirable murdered by Hitler’s regime. Told in the segmented way of most of Tarantino’s previous films, each chapter of Inglourious Basterds is a subtext that will play out by the story’s end. 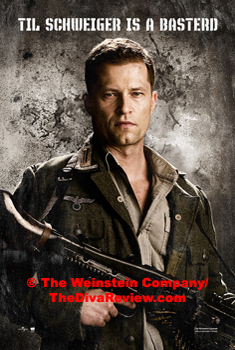 Besides Shosanna’s tale, we are given comic book studies on various members of the Basterds, particularly a near-superhuman specimen named Hugo Stiglitz. A British soldier is deployed by Winston Churchill himself to join with the Basterds and carry out a plan with an alluring German actress on the Allies’ side. This plan neatly dovetails with Shosanna’s own plot to turn a premiere of a Nazi propaganda film at her Paris cinema into a death trap for the high-ranking SS officers in attendance. Absurdities abound, but in Quentin Tarantino’s world, the surreal makes for a good script. His fierce refusal to acknowledge the lack of logic in changing history to suit his story is part of what makes Tarantino such a compelling filmmaker; he has a story to tell and no amount of actualities or mundane facts that don’t serve that tale is going to shake his vision. That vision is almost a costar of the film; the clever monologues that simultaneously confuse and beguile until the point is brought home often in unexpected ways, the placement of modern, unrelated music as a setup for the climax (- David Bowie’s Cat People gets the nod as Shosanna’s plan comes together) and an unflinching eye for violence. The Basterds’ scalpings are gory and Tarantino makes great use of WWII firepower; we also learn why another Basterd known as The Bear Jew strikes terror in the heart of the SS, who believe him to be the living embodiment of the Golem of Jewish folklore. 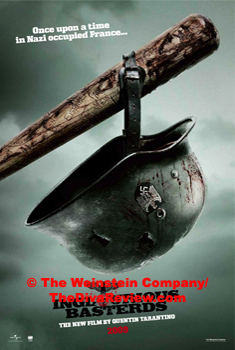 The Bear Jew’s weapon of choice comes courtesy of Louisville, Kentucky and he’s got a pretty good RBI. 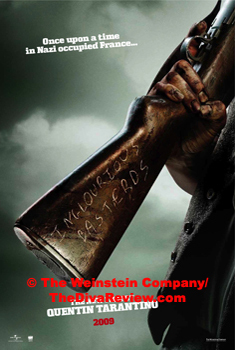 Tarantino’s love for cinema is all over this film from the fact that it’s extremely loosely based on an Italian film of the same name starring Fred Williamson and Bo Svenson (- who cameos), to the assigning of a British film critic to team up with the Basterds in the final showdown taking place at a movie premiere. Many of the conversations in Inglourious Basterds revolve around film. Shosanna’s opinions of director Leni Riefenstahl are small talk with a smitten Nazi soldier, who prefers the work of G.W. Pabst. The film’s climax is noted with some guerilla cinema by Shosanna, which gives the signal for all hell to break loose in her theatre and, boy, does it. With so much Tarantino ephemera flying around Inglourious Basterds, one might think other aspects of the film might suffer. He pretty much leaves Brad Pitt to his own devices, allowing Pitt to chew bug hunks of scenery with a rangy Southern accent that crosses three states and the Appalachians. Watching Tarantino’s fellow director Eli Roth emote in the role of the allegedly terrifying Bear Jew explains much more to me about Roth’s own films. I don’t care how much makeup he’s under, there’s just no hiding Mike Myers, or the unintentional chuckles that accompanies his bit scene as a British officer. Otherwise, Tarantino does get wonderful performances out of most of his cast: Melanie Laurent is wonderful as the gutsy, canny Shosanna, filled with muted, simmering rage at the fate the Nazis have made for her that she can’t escape. Shosanna has many of the earmarks of The Bride from Kill Bill with her revenge motives and supernatural intelligence when it comes to assassinating large scores of people. 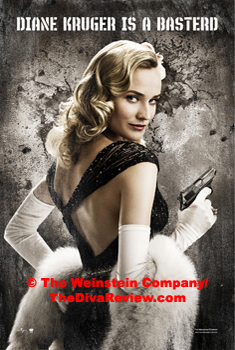 Diane Kruger does the best work I’ve seen as the beautiful German actress, Bridget von Hammersmark. The Allied spy is a cool customer who believably balances UFA glamour with practical, quick-thinking survival skills. Young Frederick Zoller is revered as the German Sergeant York for his battlefield bravery; he is played by Daniel Brühl, who gives the Axis soldier an uncomfortable amount of sweetness and charm as he attempts to court Shosanna. I wondered if it was a coincidence that Brühl resembles a young, handsomer Tom Cruise, who himself played a Nazi last year in Valkyrie. However, the standout of Inglourious Basterds is far and away Christophe Waltz in a brilliant and mesmerising performance as “The Jew Hunter,” Hans Landa. Landa’s curiously debonair manner as he picks apart his prey with words alone is like watching a snake hypnotise a small bird before wrapping around and squeezing the life out of it. Landa’s perfect Teutonic manners enable thinly veiled threats and Waltz gives the right level of camp to Landa’s offbeat wackiness attesting to the enjoyment of the deadly cat and mouse games the Nazi plays with his helpless quarry. Waltz creates the perfect balance between Landa’s hilarious silliness and the deathly scariness of the SS officer when his loopily genteel mask drops. I don’t know if any other actor has enlivened Tarantino’s script at the level Waltz does; he actually makes the material better. 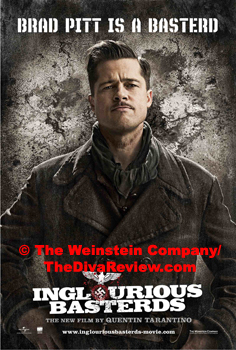 It’s a wonderful performance and I hope Inglourious Basterds does great things for the Austrian actor’s career. This hasn’t replaced Kill Bill Pt. 1 as my favourite Tarantino film, besides the foibles I mentioned above there are failings in the script; I felt more should have been kown about the other Basterds, and at times there is an odd, patchy quality to the film, as if it were hurriedly edited. Still, Inglourious Basterds is great good fun and tons of bang for your entertainment buck. More than any of its actors, this film is very much the Quentin Tarantino show with all the absurd pop culture flourishes and disbelief suspension that entails, and if that bothers you, stay away, this ain’t yer huckleberry. That he applies the affectations he’s so well known for with such heedless gusto and élan, yet gives us some fine performances and memorable characters shows that there is real heart and thought behind Inglourious Basterds. I had a blast.